While the Sumerians were inventing writing over five thousand years ago, one of the last populations of woolly mammoths was making a desperate bid for survival on a remote Aleutian island. Now, we know how they died. 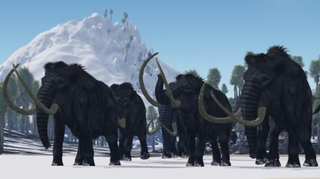 Woolly mammoths started to vanish from Eurasia and North America toward the end of the last ice age some 12,000 years ago, due to a combination of climate change, habitat loss, and human hunters. But on a few lonely islands, including Siberia’s Wrangle island and Alaska’s St. Paul, mammoths managed to hang on thousands of years longer. Now, by carefully reconstructing the history of the St. Paul mammoths, scientists have dated the population’s extinction to 5,600 years ago, plus or minus a century. The analysis, which appears today in the Proceedings of the National Academies of Sciences, also reveals the rather mundane reason these majestic creatures finally kicked it: They ran out of water. A remnant of the Bering land bridge that connected North America to Eurasia during the last Ice Age, St. Paul became an island between 14,700 and 13,500 years ago, as glaciers retreated and sea levels rose. The island would shrink rapidly for thousands of years, until eventually, it was just 42 square miles (110 square kilometers) in size. On this diminutive scrap of land in the middle of the ocean, a few dozen mammoths were cut off from the world. And for several millennia, they managed to hang on, drinking from a handful of freshwater lakes and chowing down on the island’s scrubby tundra vegetation. Then, all of a sudden, they vanished. To find out why, a team led by Matthew Wooller of the University of Alaska Fairbanks collected sediment cores from Lake Hill, a small freshwater lake located toward the middle of the island. First, the researchers analyzed traces of mammoth DNA and fungal spores found in herbivore poop to figure out exactly when the animals disappeared. They then used numerous climate “proxies,” including pollen, microfossils and stable isotopes, to tease out any environmental changes that could be responsible. Not only did the scientists hone in on a precise extinction date for the St. Paul mammoths—some 900 years later than scientists had previously thought—they were able to reconstruct a detailed series of events leading up to it. The end times of the St. Paul mammoths highlight factors that could have led to the extinction of other straggler populations, including those found on Wrangle island off the north coast of Siberia. Wrangle island is much larger, which may explain why its mammoth population outlived the St. Paul mammoths by more than a thousand years. But at the end of the day, the Wrangle mammoths likely succumbed to similar problems of resource scarcity. “I suspect it was the same thing,” Wooller said, adding that a careful paleoenvironmental analysis is needed on Wrangle to confirm the hypothesis. Graham pointed out that there is also evidence for humans co-existing with mammoths on Wrangle island, so the story might be more complex. The extinction of the St. Paul mammoths is also a cautionary tale in the age of human-caused climate change. Today, sea levels are once again rising, causing islands around the world to lose ground and decreasing the amount of space, food and freshwater available for their inhabitants. Indeed, several south Pacific islands are already facing water crises due to prolonged drought. Meanwhile, low-lying areas like South Florida risk losing their freshwater supply to direct saltwater encroachment. “Fortunately, in very dire situations, humans have something mammoths don’t: they can get on a plane and leave,” Wooller said. Of course, many island nations would rather not abandon ship, which is why they’ve been fighting tooth and nail for the world to adopt stricter carbon reductions policies to curb climate change. If the past is any indicator, time is of the essence.